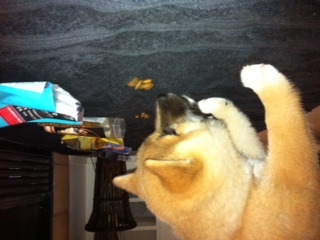 We bought a few different samples of quality kibble. “Acana”, “Taste of the Wild”, and “Born Free”. 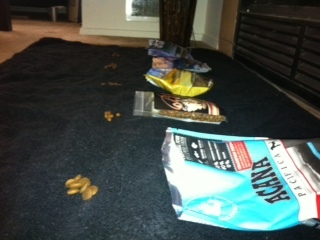 We laid out tiny samples of each next to open bags and let Kuma sample them for himself. He took quite a liking to “Acana’s” Pacifica formula and “Taste of the Wild’s” wetlands formula (After slowly tasting each sample he attacked the “Taste of the Wild” bag lol). For now, we will start feeding him Taste of the Wild Wetlands and see how that goes.